It is with great pleasure to announce my participation in the upcoming “Reinventing Tradition“ exhibition at StudioWorks by Zoom Group, curated by the amazing and talented Barrett Smyth! Founded in 1986, Zoom Group is a thriving organization that empowers, educates and employs over 250 people with all levels of developmental disabilities. StudioWorks, the art studio of Zoom Group, is a creative and inclusive atmosphere in which artists with and without disabilities thrive. Professionally-trained artists are on staff to interact with member artists daily as they deepen their talents, change perceptions, raise awareness, and beautify the community through art. 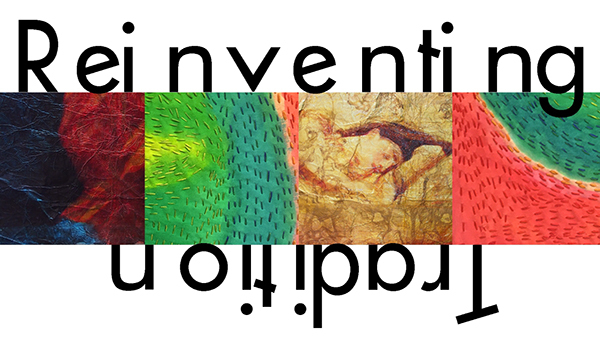 The opening reception of “Reinventing Tradition“ is Friday, October 21st from 6-9 pm. If you can’t make it that night, the exhibition will be up through December 30th. 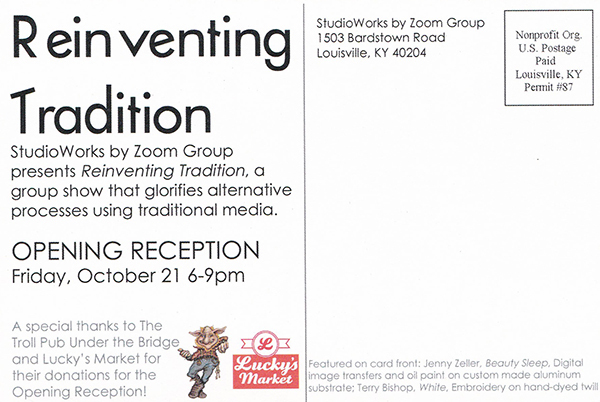 StudioWorks is located at 2008 Eastern Parkway in Louisville, Kentucky. The gallery and studio are open to the public Monday – Friday from 8:00 am – 4:00 pm and Saturday from 12:00 pm – 5:00 pm. Please share the word of this event, which will also share awareness of the awesome Zoom Group organization!